Learn how to manage a Kubernetes cluster using Minikube, a tool that runs a single-node cluster inside a local VM. An important memory corruption defense in Linux, OpenBSD, NetBSD, FreeBSD and Solaris can be bypassed by attackers to obtain root privileges. With Rollbar, automatically know what’s broken and why. 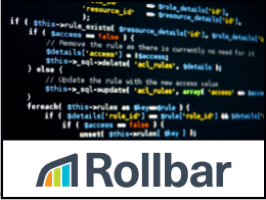 Rollbar detects and alerts you via Slack, HipChat when code breaks. Get stack trace, user data to help you catch errors before your users do. An empirical study of load balancing approaches using Liblb, a Go library that implements four load balancing algorithms. How Pinterest uses distributed trace data to understand, debug and tune its backend services. A look at how AWS RDS’s (Relational Database Service) new start/stop ability makes it possible to reduce costs. Very much a heavily detailed introductory walkthrough. You have to request ‘early access’. Not necessarily a great idea, but an interesting experiment.